Q. Net Control 2 Standard: how to move the workspace (groups and computers) and settings from one teacher computer to another. 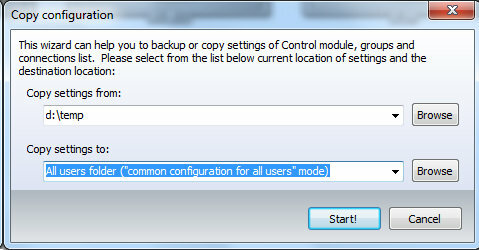 - on Advanced Options page of the appeared "Options" window click the "Backup/move old configuration" button. 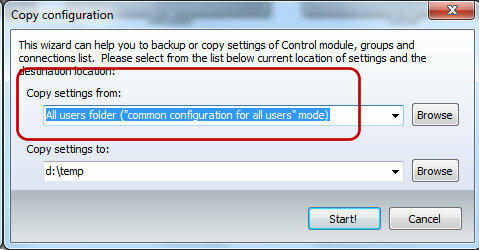 - in the "Copy settings to" field specify the backup folder where the settings should be copied. The operation does not create the folder, you need to create the folder before performing the operation. - click "Start" to start copying. 2. Copy contents of the backup folder (D:\Temp in our example) to some folder on the target computer. - in the "Copy settings to" field select a storage where the settings should be copied ("current user's folder" or "all users folder"). You need to select the storage that actually corresponds to your current configuration of the teacher console. - click the "Start" button. - when the configuration is copied, restart the teacher console. Warning! After restoring the configuration, do not save changes to the current workspace if the teacher console prompts! Otherwise the copied settings may be overwritten.